While I’ve been living in China and Hong Kong for almost seven years, I still can’t really cook Chinese food. 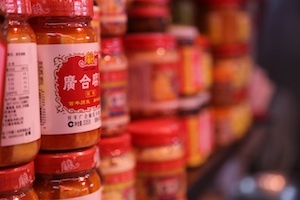 Earlier this month, while trawling Hong Kong’s supermarkets for pickled lemons for a Moroccan dish, I decided that life would be much easier (or, at least, the amount of time I spend in supermarkets looking for obscure, imported ingredients would be shorter), if I could cook Chinese food. In my first year of living in Beijing I bought a cookbook, which promised “1,001 Simple Home-Style Dishes”. When I got home and deciphered the recipes, I realised that the only thing about the recipes that was simple was the instructions. The entry for making mantou (plain, steamed wheat buns) read: “Ingredients: Dough. Method: Knead. Rest. Steam.” There was none of the patter about the dishes’ providence or inspiration that I love in English-language cookbooks, just the assumption of already-decent levels of knowledge. It seems to me that many cooks in China rely upon experience and frequent tasting of a dish when they’re cooking. I’ve hung around a lot of kitchens while leading trips (usually harassing the poor staff to make sure that everything is served pronto), and I have never seen a chef measure anything, ever. I think it’s a great way to cook, if you’re able to do it, but it does turn learning into a long process of trial and error. Fortunately, lovely people like Fuschia Dunlop and others have translated their own experience into precise recipes that even I have a hope of following. You can use any kind of leafy green vegetables for this – even lettuce is occasionally used. In Hong Kong, pak choy (白菜), gai lan (芥兰，similar to broccolini or sprouting broccoli) are both popular, but the tastiest option it to use pea shoots (豆苗). If you can’t get any of the above, then broccoli would work well too. 1) Heat the oil in the frying pan or wok and fry the garlic and ginger until they become fragrant. Throw in the green vegetables and toss a few times to cover them in the garlicky-gingery oil. 2) Add a little water if the vegetables are tough – broccoli in particular might need this, and stir occasionally. When the leaves have started to wilt down and turn bright, bright green then they should be ready – taste them to make sure and cook a little longer if the stems are tough. P.S. You may, quite reasonably, be wondering what all this has to do with travel. As you can see from my post with the recipe for Mr Lu’s Chicken, I love being able to recreate recipes from my travels at home and, to my mind, eating is one of the best ways to get to know a place. 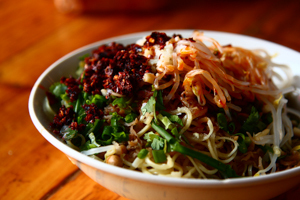 I’m off to Yunnan tomorrow for a week, and find myself getting unreasonably excited about chewy ersi noodles (the best noodles ever – take that Shanxi! ), fried eggs with jasmine flowers and Yunnanese cheese, yum… Expect more recipes upon my return.